Joudie Kalla, author of the bestselling Palestine on a Plate, introduces readers to more of the Middle East’s best kept secret—Palestinian cuisine. “Baladi” means “my home, my land, my country,” and Joudie once again pays homage to her homeland of Palestine by showcasing its wide ranging, vibrant and truly delicious dishes. Palestine is a country of different seasons and landscapes, and it is these diverse conditions that create the many and varied ingredients featured in the book. Joudie takes an entirely flexible approach to cooking, using influences from her home to create new dishes, and bringing her own twist to more traditional recipes. Baladi features recipes according to the area that they hail from, such as the land, the sea, the fields, the orchard . . . Experience the wonderful flavors of Palestine through Daoud Basha (lamb meatballs cooked in a tamarind and tomato sauce), khubzet za’atar (za’atar brioche twists), samak makli bil camun (fried fish selection with zucchini, mint and yogurt dip), atayef (soft pancakes filled with cream in an orange blossom sugar syrup), and many more sublime flavor combinations. With stunning color photographs to accompany each recipe, the book is also interspersed with shots of the landscapes, streets, and people of Palestine, reflecting the rich culinary culture running through the whole country. “Baladi” means “my home, my land, my country,” and Joudie once again pays homage to her homeland of Palestine by showcasing its wide ranging, vibrant and truly delicious dishes. Palestine is a country of different seasons and landscapes, and it is these diverse conditions that create the many and varied ingredients featured in the book. Joudie takes an entirely flexible approach to cooking, using influences from her home to create new dishes, and bringing her own twist to more traditional recipes. 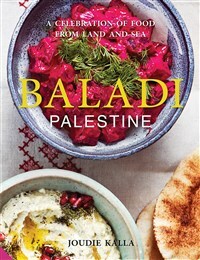 Baladi features recipes according to the area that they hail from, such as the land, the sea, the fields, the orchard . . . Experience the wonderful flavors of Palestine through Daoud Basha (lamb meatballs cooked in a tamarind and tomato sauce), khubzet za’atar (za’atar brioche twists), samak makli bil camun (fried fish selection with zucchini, mint and yogurt dip), atayef (soft pancakes filled with cream in an orange blossom sugar syrup), and many more sublime flavor combinations. With stunning color photographs to accompany each recipe, the book is also interspersed with shots of the landscapes, streets, and people of Palestine, reflecting the rich culinary culture running through the whole country.